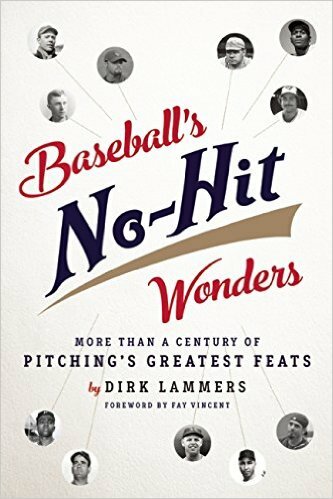 In Baseball’s No-Hit Wonders: More Than a Century of Pitching’s Greatest Feats, Dirk Lammers chronicles the prowess and the people surrounding some of the most historic events in all of sports. This amazing book takes the reader from the well-known to the obscure with the fascinating stories and stats of every no-no and every close call for more than a hundred years. Baseball’s No-Hit Wonders is well-written, well-researched, entertaining, and informative. Full of eye-witness accounts and behind-the-scenes details, the book is riveting from start to finish, and includes every no-hitter in recorded baseball history as well as the story of the pitcher who threw a no-no while under the influence. It was quite a trip. I loved every minute of Baseball’s No-Hit Wonders. It is a must–read for any baseball fan. I was given a free copy from the publisher in exchange for my honest review. This entry was posted in Book review, My Book Shelf, Sports and tagged Baseball's No-Hit Wonders, Dirk Lammers, Major League Baseball, no-hitters, Non Fiction, pitchers, records, sports. Bookmark the permalink.